What’s up, Doc? 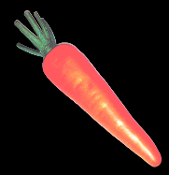 Show some-bunny how much you love them with this replica imitation giant size garden carrot! Approx. 8.25-inch tall including green stalk, x 2-inch across at the widest. Fun artificial veggie accessory for snowman, bunny rabbit costume, Easter decoration, gag gift, joke, prank, pretend play, theater stage prop, magic show, photo or store display! Big lifelike faux food Plastic and Dense Foam Painted Carrot. Spring garden scene, magician or theatrical prop building supply accessory. Funny Peter Cottontail Rabbit Easter Bunny costume accessory, new in manufacturer package. *NOT a TOY - Not intended for use in play by children under 14 years of age.